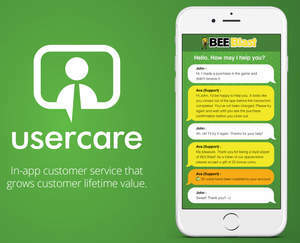 SAN FRANCISCO, CA--(Marketwired - Nov 16, 2015) - UserCare today announced the launch of a private beta of its mobile-focused customer service platform to help app publishers grow customer lifetime value and improve retention. UserCare is an easy-to-integrate SaaS service tailor-made for mobile applications that uses in-app messaging and data-driven user segmentation tools to assist app developers in cultivating their highest value customers with prioritized service. App publishers operate in an increasingly competitive marketplace. Though Juniper Research predicts the market for mobile apps will reach $99 billion by 2019, very few apps succeed. Engagement drops off rapidly after initial install, with only some three percent of users still engrossed with an app 30 days later, according to research from eMarketer. Poor customer support is one major reason for that drop off. Many companies today launch apps with no support but an email address. That's not good enough: eConsultancy found 83 percent of consumers require some degree of support while making an online purchase, and according to Forrester, 45 percent of US consumers will abandon an online transaction if their questions or concerns are not addressed quickly. "The customer service solutions available to app developers today are oversimplified in that they treat all customers equally regardless of how much value the customer drives for the business," said Barry Coleman, CEO at Usercare. "UserCare marries data analytics and customer service in the same interface so that companies can prioritize delivering higher-touch service to their best customers, leveraging customer event data to help drive effective first-contact issue resolution." Even the leanest app publishing teams can deliver real-time customer service through their apps with a simple integration with the UserCare SDK. With UserCare, publishers can provide support using mobile messaging and push notifications, enable customer self-service through FAQs and grant instant rewards through an intuitive web-based interface. Support helps app publishers keep customers engaged -- which is critical because Bain & Co. found that just a 10 percent increase in customer retention levels results in a 30 percent increase in the value of the company. UserCare goes further than other customer service software products because it allows app developers to leverage first-party data from the application to create value-based customer segments and deliver differentiated service to their most high-value users -- the approximately 20 percent of customers who drive 80 percent of the revenue. "At Addiktive, we understand how important it is to nurture our very best customers. We try to interact with them regularly through social media when we can link to them. We've always wanted to give our high value players a direct channel to interact with us and grant them special access to the latest features and betas," said Pedro Navarro, CEO and founder at Addiktive Games. "What UserCare is providing aligns with our approach and would allow app developers to identify high values players and have these valuable interactions directly in the app in a more scalable, trackable way." UserCare is currently accepting applications for its private beta program. Private beta participants will receive free access to the full features of UserCare for the duration of the program. To learn more about the UserCare beta, please visit www.usercare.com or contact info@usercare.com. UserCare provides in-app customer service software that helps companies grow customer lifetime value by blending user support with relationship management. UserCare integrates seamlessly with your app though a simple SDK to enable mobile messaging support, self-guided help, real-time rewards, and customer segmentation. Our unique Customer Chronicle™ feature provides an interactive visual view of how each user is engaging with your app to guide issue resolution, drive product development and gain customer insights. Visit www.usercare.com to learn more. UserCare delivers in-app customer service that grows customer lifetime value.